BEAST is an advanced dynamic simulation tool for rolling bearings and other mechanical systems with contacts. As proprietary SKF software, it helps SKF engineers build knowledge about their products and design products fit for use in ever more demanding applications. BEAST is part of the armoury of tools and knowledge that SKF engineers have to support in bearing development and application design. An advanced dynamic simulation tool for rolling bearings and other mechanical systems with contacts available through SKF Engineering Consultancy Services, BEAST analyzes what will happen under real conditions and predicts the behaviour of complex equipment that incorporates rolling bearings. Rolling bearings are machine elements that provide high precision and load carrying capacity together with low frictional moments, vibration and noise emissions. Rolling bearings have been common machine elements for more than 100 years, with the result that vast experience has been accumulated about their steady-state behaviour, such as load carrying capacity. However, most phenomena that occur in rolling bearings are dynamic by nature, and understanding of this dynamic behaviour has not yet reached the same level of maturity. 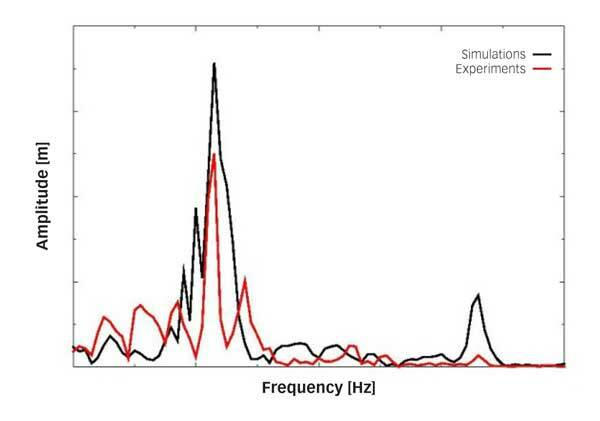 To study and predict dynamic phenomena, a dynamic simulation tool is needed. 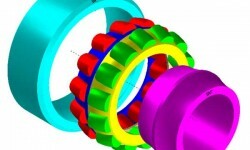 One such tool is the BEAring Simulation Tool (BEAST). It is a three-dimensional multi-body simulation tool specialized in detailed contact calculations, making it a very efficient tool for rolling bearings and other machine elements where contacts are important. Figs. 1, 2 and 3 show some ex­amples of BEAST models of products where contacts are important. The tool simultaneously solves the dynamics of the multi-body system, the structural deformations, the thermal balance and the local lubricated contact conditions. BEAST is used for optimizing product design, for evaluating performance under various application conditions and for advanced damage and failure analysis. The focus of this article is to describe the main aspects of the tool techniques and to exemplify by presenting a real application case. Model composition is performed with a graphical tool (fig. 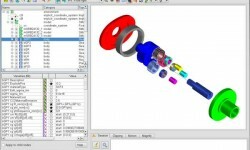 4), which enables the user to build from scratch, import, connect and combine models from a predefined library of basic models and components, including general CAD bodies. Existing components can be copied or exported for later reuse. models, including coordinate systems, bodies and other models (i.e., hierarchy of models). User-defined parameters can be defined at different levels in the model. They can be defined as expressions of other parameters. The parameter lookup follows the model hierarchy. Typically user-defined parameters, or expressions of those, are used for all inputs. This simplifies model building, makes reuse of model components easy, facilitates use of standardized design parameters and prepares for parametric studies. The geometry description is very general, and details can be specified. 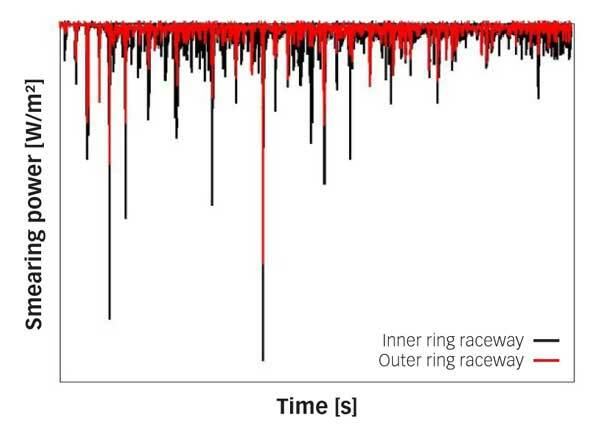 The reason for this is that small features may result in quite large differences in bearing performance, such as roller stability or contact pressure distributions. The effects of small-scale geometric variations such as surface roughness are taken care of in the tribology model. A rolling bearing is always part of a machine. Depending on what is known about boundary conditions, parts of the machine may also be modelled. BEAST provides versatile models for the connections, called ties, in order to make realistic modelling of real applications possible. If the boundary conditions are represented by models available in other tools, then co-simulation can be employed to connect these models. 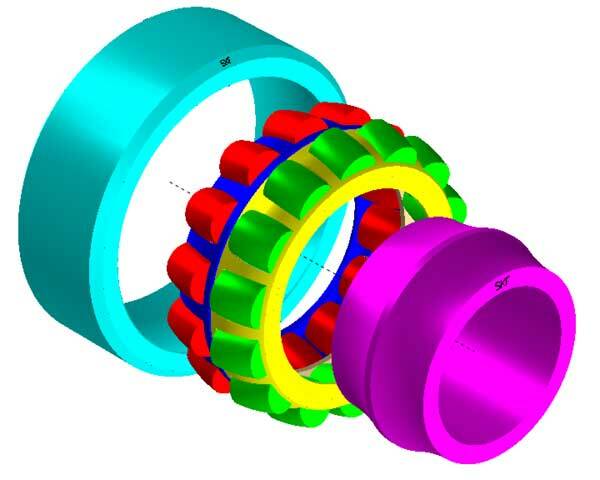 The contact-force model is the most important part of any rolling-bearing simulation model. Considerable demands are put on the contact model when it comes to calculation speed, generality, stability and accuracy. An elastic contact model in BEAST includes three-dimensional elastic effects of arbitrary geometry. This model has been verified against finite element method (FEM) models and experiments and gives an exact solution for Hertzian contacts. 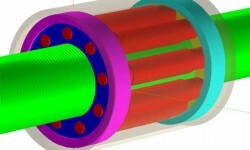 The influence of lubrication is based on an elasto-hydrodynamic lubrication (EHL) contact model. The friction depends on lubricant properties, separation and surface roughness. In BEAST, the detailed contact deformation is separated from the structural deformation – i.e., the flexible bodies act as a boundary condition to the contact model. 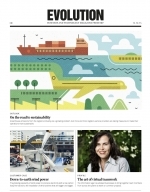 For structurally flexible bodies, reduced models, global shape or CMS (component mode synthesis) are used. The rigid body motion is separated from the flexibility in such a way that a structural deformation will not move or rotate the mass centre. This gives a good representation of flexibility and arbitrary large motion of a flexible body. For the CMS technique, a number of mode shapes are computed by FEM. It is essential that suitable mode shapes are available to the user in order to be able to represent the application accurately. BEAST currently has static deformation shapes on surfaces, static load shapes on surfaces or points, centrifugal mode shapes and free and constrained eigenmodes. The thermal equations are solved using the same technique as described above for flexibility. However, for coupled thermo-mechanical deformation modes, the deformation is created from the temperature field. The user can control what combination of analysis should be done for each individual body. For thermal calculations, the user can also accelerate the equations, which is practical since it can be a very slow phenomenon. There are many important phenomena that are active on a contact surface, such as wear, fretting, smearing, slip, sub-surface stress, fatigue, etc., which can be simulated in BEAST. The starting point for simulating these is the contact surface data (such as pressure, shear, film thickness, power, etc., at each time instance) from the contact model. Wear is an important failure mode in contacts having significant slip and insufficient separation, which can occur in cage contacts. The wear model covers adhesive wear, abrasive wear (including particles) and the effect of separation. The wear model actually modifies the geometry of the surface during the simulation. There are more detailed models of surface phenomena that resolve roughness in detail. These are far too computationally costly to be performed during dynamic simulation. 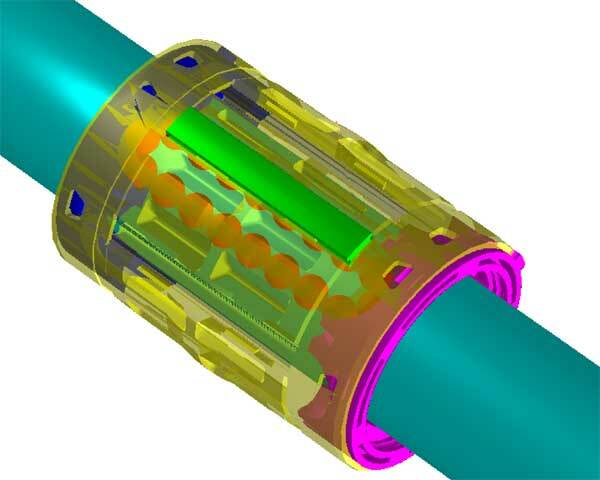 Instead they can be done in the post-processing, taking the boundary conditions for a contact from the dynamic simulation, and the detailed analysis at the chosen time instance is then performed. BEAST tools have integrated support for Design for Six Sigma (DfSS) methodology. The majority of the BEAST simulations are done as part of parametric studies or optimization runs. There is tool support for designing experiments, to define performance criteria from BEAST output, to create multi-criteria desirability functions and to launch the complete parametric study on a cluster of computers. For post-processing several types of analysis are supported, e.g., parallel charts, Pareto fronts and response functions. Active magnetic bearings (AMB) are typically used in rotating shaft systems where the shaft is supported by magnetic forces. Under normal operation the rotors are levitated and have no physical contact with the supporting structure. The sensitive magnetic parts are protected by touchdown bearings (typically a set of angular contact ball bearings or a deep groove ball bearing). These bearings normally have a clearance between the inner ring and the shaft that is smaller than the clearance between the magnetic parts. When the shaft drops on to the touchdown bearings under operation, they experience heavy impact loads and fast accelerations. Three different machines (5 – 180 kg of rotor mass) have been subjected to drop tests and have been simulated in BEAST . Touchdown bearings operate for very limited periods of time, which means that traditional rolling contact fatigue failures do not occur. Instead the failure modes are more related to high power dissipation in the contacts due to high slip speeds and heavy loads combined with poor lubrication conditions. fast acceleration may lead to high sliding power, leading to smearing damage. Touchdown bearings are tested in “drop tests”, where the magnetic bearings are turned off and the shaft is allowed to land and rotate on the touchdown bearings until the shaft reaches a standstill. This is repeated until the required number of drops has been reached or a failure has been detected. During the drops, the shaft motion is monitored using the built-in position sensors. The shaft positions have been used to verify the BEAST simulations of the drop tests. After the drop experiments, the touchdown bearings are examined for any damage. A number of touchdown bearing configurations have also been modelled and simulated in BEAST. The dynamic nature of the drop tests make BEAST the most suitable tool for gaining more insight into the conditions that the touchdown bearings experience. The shaft system, modelled to the detail needed to have the right rotor dynamics properties, e.g., mass, moments of inertia and flexibility, if needed. The touchdown bearings, normally consisting of a pair of spring-preloaded, full-complement angular contact ball bearings. All bearing components and contacts are modelled in detail. The bearings are soft-mounted in the housing. In BEAST, this is modelled with a pair of spring and damper ties. 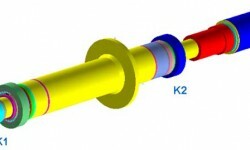 The contacts between the inner rings and the landing sleeves of the shaft are modelled in detail. The 7-axis rig has its name from the seven axes of magnetic support: three radial bearings (two axes each) and one axial bearing. The rotor is made up of several parts and is about 2 m long, weighing 200 kg, and is relatively flexible (fig. 5). The bearing arrangement makes it a hyperstatic application. 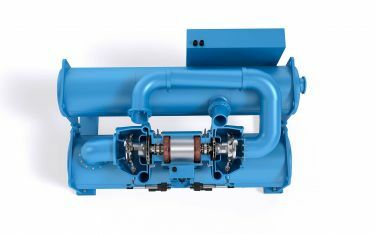 The rig is a scaled-down version of a natural gas compressor. Even after the magnetic bearings have been shut off, there is a speed-dependent axial process load from the compressor stage. A number of drops were performed. In each drop the shaft was delevitated for 5 seconds at full speed without any external braking. The axial load generates very quickly a (forward) whirl motion at all bearing positions. There is a good agreement between tests and simulations. 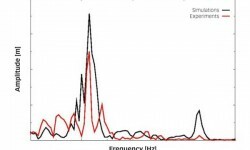 Further information can be found by looking at the frequency spectrum. 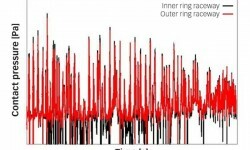 The main whirl frequency of 110 Hz is clearly visible (fig. 6). 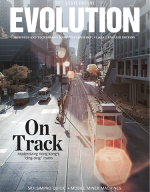 The macroscopic behaviour that has been shown so far might be reproduced with other specialized simulation software as well. However, if the focus is on the internal conditions in the touchdown bearings, BEAST has unique capabilities. All contacts can be studied in detail, e.g., contact pressure, sliding conditions, power loss and risk of smearing damage. The most interesting contacts are between the inner ring of the touchdown bearings and the “landing” sleeves of the rotor, as well as the internal contacts in the bearings, i.e., contacts between the rings and the balls and between the balls (full complement). At the beginning of the drop the ball bearings are stationary while the rotor speed is 20,000 r/min. The bearing, which is loaded axially as well as radially, will accelerate the fastest. 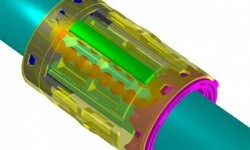 The contact pressures in the ball to raceway contacts are shown in Fig. 7. The plots show the data for the most loaded row of each bearing pair. This bearing set takes the heaviest load. It is the smallest bearing set and takes both radial and axial loads. The contact pressure is high enough to be detrimental. Even at lower contact pressures the power loss generation or risk for smearing may be dimensioning parameters. The “smearing” power, i.e., the power loss per unit area, is shown in Fig. 8 for the bearing that shows the highest levels. They are high enough to be detrimental. After a number of drops this bearing set did indeed fail due to overheating and seizure. The raceways of the most loaded row were heavily deformed and discoloured. 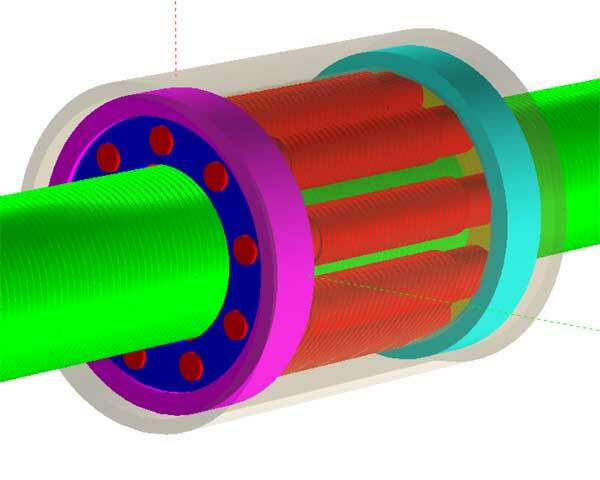 The purpose of the simulations in BEAST was to better understand the applications and the conditions to which the touchdown bearings are subjected, in order to be able to design more robust systems that can withstand a larger number of shaft drops. The BEAST models of the different test rigs could model the global behaviour with high accuracy and also pinpoint which bearings would fail. 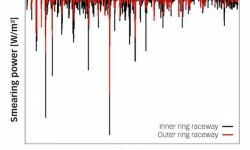 Both the macroscopic behaviour, e.g., rotor dynamics, and the detailed bearing performance could be evaluated. The models were proven to work for a wide range of different rotor designs and physical sizes. 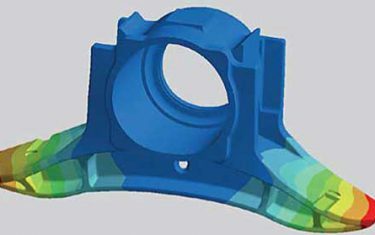 Taking results from the complete study into account, the design team found the decisive parameters for the touchdown bearings and their application. The study gave insight into design limits for a number of parameters, such as the maximum contact pressure, bearing friction, smearing power development and soft mounting conditions. 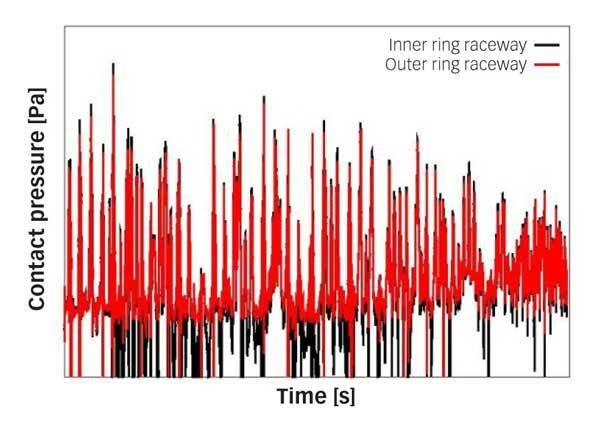 These parameters can be calculated in the simulations, and thus can give the bearing and system developers valuable data for the development of robust products. 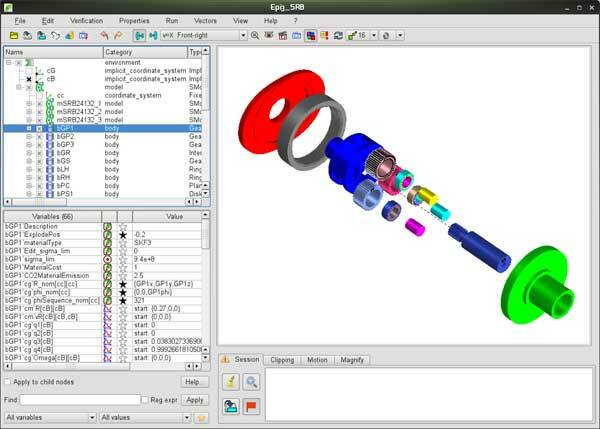 BEAST is a dynamic simulation software specialized in the analysis of mechanical systems with contacts. It can be used both for the development and design of rolling bearings and for the analysis of rather complex systems where rolling bearings play an important part. 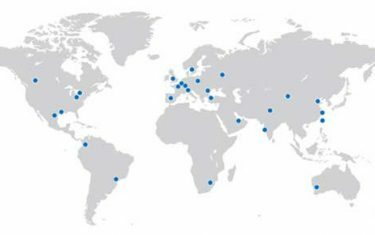 Though BEAST is a proprietary SKF program for internal use only, SKF’s customers can benefit through the services of SKF Engineering Consultancy Services. J. Anders, L-E. Stacke and P. Leslie. Rotor drop simulations and validation with focus on internal contact mechanisms of hybrid ball bearings. In Proc. of ASME Turbo Expo, San Antonio, Texas, USA, June 3–7, 2013.